MAUI VACATION DAY 4 :: WAIANAPANAPA STATE PARK, HANA, HI :: When we were planning our trip, we didn't think we would drive to Hana, as Kristie has a low tolerance for roadtrips, especially roadtrips that contain curvy roads. 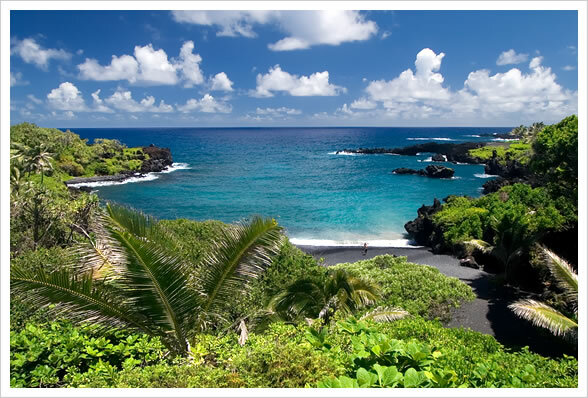 The famous Road to Hana is perhaps the curviest in the world, with approximately 600 twists and turns along 52 miles of narrow, mostly one-lane road that crosses 52 bridges and is often right on the edge of shear cliffs dropping several stories into the ocean. 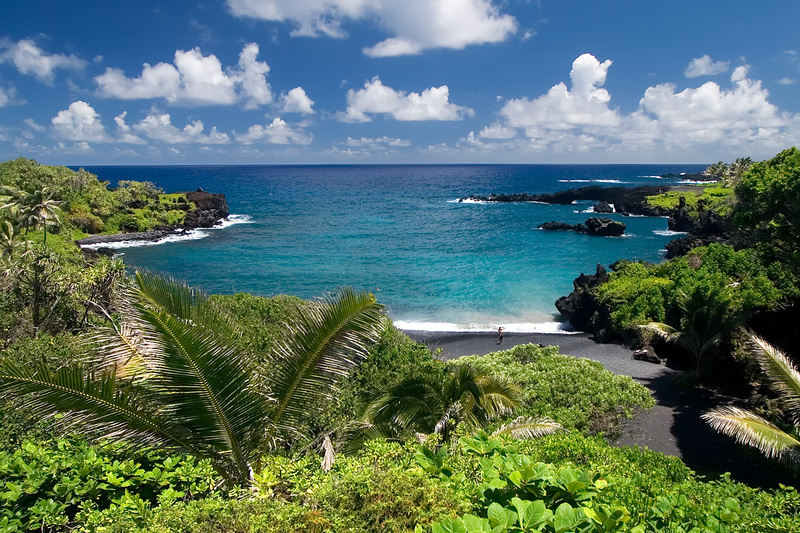 We really wanted to see the black sand beaches and the bamboo forest near Hana, so we thought we'd give it a try. The three hour drive was actually fun and very scenic. The entire way is green and wet. We saw a wide variety of plants and many waterfalls, and also passed by several small towns and charming vendor shacks along the way. The photos do not do it any justice, but Honokalani Beach is probably one of the most strikingly beautiful I've ever seen - vibrant green vegetation, deep blue sky and turquoise water crashing in white foam against black sand - it was pretty cool. The pumicey sand is coarse and the water is filled with poisonous jellyfish, so I wouldn't want to swim here, but I could look at this beach all day. We also found some neat caves adjacent to the beach and a blowhole. This stop might have been worth the drive alone, but we had one more destination: Waimoku Falls. Beautiful pictures, nice description! Hope to be there one day..
Glad to see you have such a great holiday, and I'm glad to see the classic "John and Kristie self portrait in front of a wonderful scene" in this set. I was interested in Honokalani Beach. Like all the sites I've been to, there are beautiful pictures, but I think these are the best! Stunning pictures. I am planning a trip to Maui with my love, and your photos definitely convinced me that this beach should be among our destinations.